Upward Base Case for the US as the New York Fed’s GDP projection model shows the 4th quarter of 2017 growth at almost 4% (annualized) while the Atlanta Fed’s GDPNow model a lower but still strong +2.7%. Q3 2017 came in at 3.2% per the latest estimate. The Federal Reserve at its December meeting raised interest rates for the third time in 2017 as expected to 1.5% and lifted its estimate for economic growth next year to 2.5% from 2.1%. Three more rate increases are set to come in 2018 at th e current estimate and the balance sheet is slowly declining. 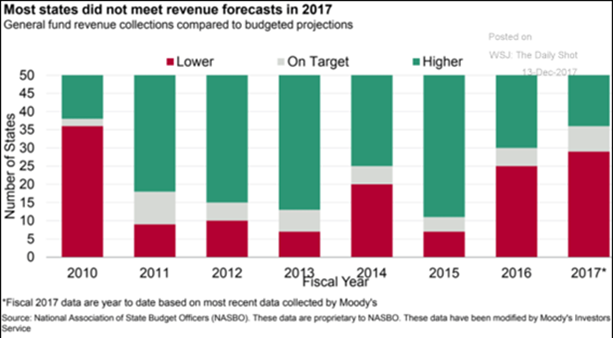 Q1 2018 is set to see a greater reduction per month from $10 billion to $20 billion in debt securities. The Fed has plenty maturing every month so maintaining a smooth schedule should not be a question this year. Inflation still looks to be contained though November Retail Sales (both core and total) came in much stronger at +0.8% versus +0.6% expected. Are those for real or are they Christmas sales pulled forward to “Black Friday?” Other industrial metrics continued to post good numbers with both Durable Goods and Factory Orders rising faster than expectations. Employers added fewer than expected jobs in December but South Bay Research pointed out that governmental seasonal adjustments eliminated too many positions. Average hourly earnings increased with overall hours and overtime at recent highs. Finally, from the Federal Reserve, the US has one job opening for every worker – the highest level in decades per the WSJ (see graph at right). There is work to be done! Fiscal Train Keeps on Rolling Politicians love to spend money, especially today with the payback in the future. Hence the $1.4 trillion in tax cuts over the next ten years from the Republicans (not that I think that the Democrats have done anything else, just in a different manner for different constituencies). Of course that is nothing compared to what a Michigan State University economist is saying which is from 1998 to 2015 that the US government spent an extra $21 trillion between the departments of Defense and Housing and Urban Development that had not been authorized under the budgetary process. Where did the money go? The DoD announced on December 7th that it will conduct the first department-wide, independent financial audit in its history to find out. Check in after a year. 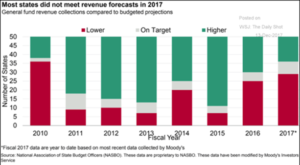 Meanwhile, state finances are missing revenue targets at the highest level since 2010 per Moody’s and National Association of State Budget Officers (see right), giving little room for their fiscal stability. Retail is still expected to suffer as 12,000 stores are projected to close in 2018 versus the 9,000 stores closed in 2017. 3,600 closings were already announced by January 1st, led by Walgreens, Ascena (Ann Taylor, Loft, Dress Barn), Rue21 (ToysRUs) and Teavana. Sears, Bon-Ton, Bebe, Destination Maternity are all expected to declare bankruptcy this year, though not all their stores will close. Free Money Still Available The US Federal Reserve may be cutting back, but Draghi and his ECB are still at it, buying corporate bonds at a lower level than 2017 (from €60 billion per month to €30 billion) but for longer (until at least September, but no promises on when). Of course, when one is buying that much (including over €100 billion in corporate bonds), one ends up with some worthless trash, including about €20 billion junk bonds. One of those, Steinhoff, lost about 50% of its value in last months of 2017, hitting the ECB for a €50 million loss per the FT. A small number versus the €5 trillion on its balance sheet but embarrassing nevertheless. The Swiss central bank had to buy out one of its banknote printing supply companies or otherwise it would have ceased production. For a “company” that made about $55 billion in profits, the SNB could easily afford to put $20 million in one of its suppliers! 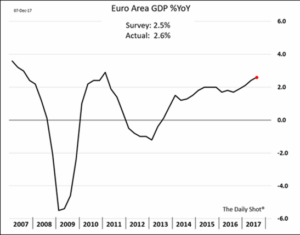 Europe “Growing” on Free Money as Eurozone manufacturing reported their strongest activity level in the month of December since the foundation of the Euro in 1997 as measured by the purchasing manufacturer’s index. Other economic measures are coming in positive. Industrial Production grew +3.7% year-on-year, beating estimates. Eurozone unemployment fell to 8.7% in November from 8.8% the month before. German retail sales rose by 2.3% on the month in November, smashing expectations for a 1% increase. 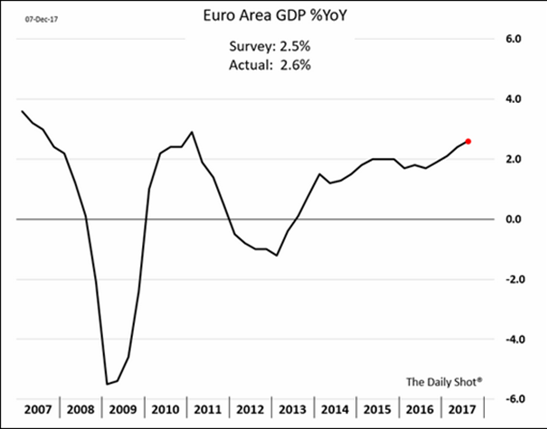 Finally, Eurozone GDP growth ticked up to +2.6% year on year for Q3 (see right). Europe needs cheap money as Brussels is asking for an extra €13 billion next year to cover the hole from the UK leaving under Brexit (which negotiations are slowly sputtering along though UK PM May is struggling with cabinet issues. China Continues Realignment while racing against the demographic clock, working to get its economy in shape to take on its swelling retirees in the next few decades. The official numbers so far look good enough to see a +6.7% GDP growth for 2018. The latest Retail Sales were +10.2%, Industrial Production +6.1% and Investment +7.2% (all meeting expectations). Export growth jumped unexpectedly to 12.3% year-on-year in November (vs. 6.8% in October and consensus at 5.3%) while imports growth held up at 17.7% year-on-year (vs. 17.2% in October and a forecast of 13.0%). Of course, this cost $3.6 trillion in new credit issued year-to-date October 2017 so not sure how long this can keep going. Chinese AAA corporate bonds with a five year maturity for example moved from 3.9% to 5.4% over the course of 2017, increasing interest costs almost 50%. We have not seen signs that the central government is dipping into its assets yet, but something to be mindful of. Meanwhile, to deal with overcapacity (and over-employment) in the steel industry, the Ministry of Industry and IT announced continued cuts in existing steel production facilities and “strictly” ban new ones in 2018. We shall see if the local governments can stand the political pressure over the job losses. Japan Held On to growth, beating the quarterly expectation to be up +2.1% on a rolling annual basis ending September 2018. November was a good month for exports, which grew for the twelfth month in a row. China is a big piece of this – shipment to that destination increased 25% year-on-year – while those to the US and EU both grew 13%. 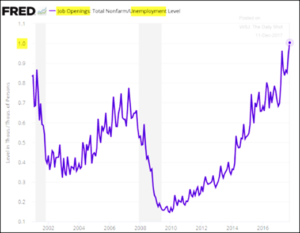 Unemployment fell to the lowest level in 24 years to 2.7% while the number of open jobs to applicants reached the highest in 44 years! On the equity side, the Japanese government pension fund which set a 25% target for equities in its portfolio reached that level in November (after starting at 0% a few years ago). 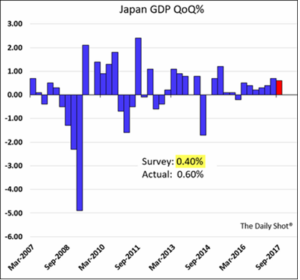 Barring a further percentage increase, they will be selling into equity strength and buying weakness, lessening support of the Nikkei. The Japanese central bank though is still buying local equities, like the Swiss are doing in the US and Europe. The economic leverage continues! In unusual news, Bloomberg reported that a plumbing problem in Geneva led to a discovery that someone was flushing tens of thousands of Euro bills down the toilet at a local UBS branch. While destroying banknotes isn’t a crime in Switzerland, “there must be something behind this story,” said Henri Della Casa, a spokesman for the Geneva Prosecutor’s Office. Indeed! Best of investing in 2018!